It’s one of the enduring tropes of internet car wisdom – whenever some poor sap asks for suggestions on what car to buy, invariably a top answer is Miata. Indeed, the venerable Mazda roadster is praised for a great balance of performance, dependability, and ease of both repair and modification. Consider the iconoclast in this scenario, if you will. Someone who doesn’t want to drive the same thing as everyone else but would still enjoy a sporting two-seat roadster. Easy repairs and a wealth of enthusiast support are a plus, as well as timeless style and a budget-friendly buy-in. In this case, there is a pair of cars from the Sixties and Seventies that will neatly check every box – both imported from island nations. 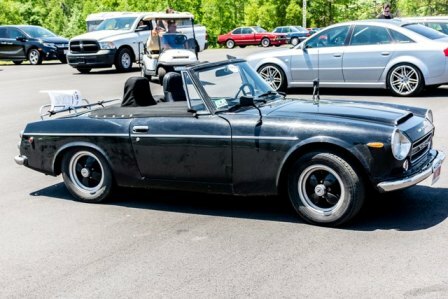 The classic MGB from England, and the similarly styled Datsun Roadster from Japan may look quite similar on the surface, but there are plenty of differences that might make either one ideal for you. The history of MG – Morris Garages, originally – starts in the 1920s with Cecil Kimber, who modified the Morris cars he sold and serviced into sports and racing cars with great success. After the Second World War, American service members who’d been stationed in the UK brought back with them a passion for the T-series roadsters, which kickstarted an import boom. It’s fair to say that the first sports car in America was the MG TC. These were rustic cars, to be certain, with old-school swooping fenders, upright radiator shells, and more than their fair share of structural wood. By 1955, enthusiasts were clamoring for something more substantial, which brought forth the MGA. Sporting a more modern bodyshell atop a sturdy ladder frame, the MGA had a more-weathertight soft top and more creature comforts. More competitors from more nations highlighted some of the MGA’s flaws as the years progressed, so in 1962 a successor was revealed – the MGB. Built with modern unibody construction, the ‘Bs handling was much improved, and performance was improved with an enlarged (1.8-liter versus 1.6-liter in the MGA) pushrod four cylinder. The MGB continued with few significant structural changes – but some significant mechanical differences – for a whopping eighteen years, concluding production in 1980. The MGB retained a 1798cc engine for the entire production span, though in 1965 the engine was upgraded from three main bearings to five for better reliability at higher engine speeds, and in 1975 the traditional dual sidedraft SU carburetors were replaced with a single Zenith-Stromberg carburetor better suited to meeting the ever-more stringent American-market emissions regulations. Minor detail changes occurred from year to year to the grille, trim work, and tail lamps; a major visual change came in mid-year 1974 with the appearance of bulbous black rubber bumpers. Mated to those bumpers was an increase in ride height to meet American-market safety regulations. These changes served to blunt the performance of the once-sprightly sports car and led ultimately to the exit of MG from the US market at the end of MGB production in 1980. Still, with over half a million cars produced over eighteen years, the MGB was the most ubiquitous sports car until the arrival of the Miata ten years later. To this day, an industry has been maintained keeping these beloved cars on the road, up to and including entirely new body shells – made from the original stamping dies! – from England. 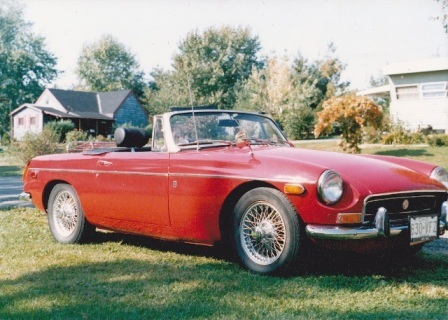 I helped to restore the red 1970 MGB shown here with my father for my stepmother – I must have been around 11, which means I never got a chance to drive this ‘B. I’ve been behind the wheel plenty, though – my early garage chores included pumping the brake and clutch pedals to help bleed both hydraulic systems. Later that fall, Dad and I drove to the step-grandmother’s house, where we stored the MGB for the winter as another project was arriving. As it turns out, we had a pair of projects that winter, as my stepmother (who had been following behind in the MG) arrived hours late with the roadster on a tow truck. So young Chris got to learn about engine rebuilds. He also learned what happens when you forget to note the proper rotation of the distributor and install it 180 degrees out of phase. I distinctly recall crouching down so I could look directly into the throats of the side-draft carburetors while dad cranked the engine. The backfires singed my eyebrows. Yes, I was quite literally burned by that car. Yet I miss it. While Nissan has prewar roots, much of the company’s postwar success is owed to a partnership with Austin of Great Britain, where initially the English firm would send knock-down kits to war-torn Japan to assemble, and eventually helping set up mass production of licensed cars. In 1959, Nissan brought forth the four-seat, one-liter Fairlady roadster. Very few of these slow, staid cars sold in the US during the three-year production run, but many better things were to come. A note on names: First, Nissan is the corporate name of the automaker, but Nissan used the brand name Datsun in many markets including the US until the mid-1980s. It’s been suggested that the proud corporate name was avoided in the US in effort to shield the company from any shame or embarrassment should the product flop in the marketplace. Further, the Datsun sports car used many different names. The Fairlady name is derived, legend holds, from a Nissan executive’s infatuation with the star of the Broadway musical “My Fair Lady.” The Fairlady name did not work well in the US, however, and American Datsun executives (most notably Yutaka Katayama) sparred with their Japanese counterparts. 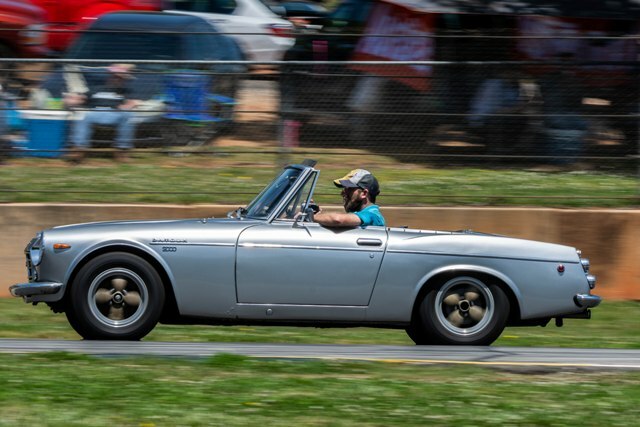 Eventually, the Datsun roadsters would variably be known either as “Roadster,” by their rough engine displacement (1500, 1600, 2000), or by the chassis code (SPL 310, SPL 311, SRL 311). We will use the engine displacement from this point forward. In 1962, Datsun brought forth a thoroughly modern roadster, the 1500. Unusually, the 1500 was a three-seat car, with a sideways-facing seat behind the front passenger seat. Most 1500 roadsters wore the Fairlady badge. Visually, the 1500 was strikingly similar to the MGB, though there were significant mechanical differences. Most notably, the Datsun retained a traditional body-on-frame construction, rather than the modern unibody of the MG. Interestingly, while many assume that the Datsun roadster line was a shameless copy of the MGB, the Datsun was actually shown to the public first – at the springtime 1962 New York Auto Show, while the MGB was released later that summer. 1965 brought significant mechanical changes to Datsun – including a larger engine – thus, a model change to 1600. Visually quite like the 1500, the third seat was abandoned, as were the Fairlady badges. Significantly, the 1600 moved from front drum brakes to eleven-inch disc brakes, giving more consistent stopping power. The middle of the 1967 model year brought the biggest changes yet – a new overhead cam engine pushed to 1982cc’s. This engine upgrade brought a big increase in power – from 90hp up to 135hp. Further, one could specify a 150hp upgrade either from the factory or added later via the Datsun Competition catalog. The upgrade added larger Mikuni/Solex carburetors, a high-performance camshaft, and a large-capacity aluminum oil pan. In 1968, both the 1600 and 2000 roadsters had safety-related changes. Most noticeably, the windscreen was made taller, with a stouter frame. Dashboards went from metal to plastic, and toggle switches were replaced by knobs. The roadster line continued with a few minor changes through the 1970 model year, when the overwhelming success of the 240Z coupe – paired with the general industry paranoia that US regulators would soon prohibit all open cars – made the 1600/2000 superfluous in the Datsun lineup. Roughly forty thousand Datsun roadsters rolled off the line between 1962 and 1970. Your author doesn’t have a ton of experience with the Datsun Roadster in any form, other than your typical ogling and drooling from afar. As I mentioned above, a second project displaced the MGB from our main garage when I was young – a Datsun 240Z – thus I was exposed to much of the vintage Datsun lineup. We never owned a Datsun Roadster, however, as there seemed to be very few here in the rust belt. Indeed, nearly twelve MGBs were built for each Datsun roadster, so certainly finding a ‘B for sale will be an easier task than a 1500/1600/2000. Coupled with the general view that the Z is revered among Datsun enthusiasts means the predecessor is relatively unknown, whereas the MGB is by sheer ubiquity the MG most Americans will ever know. As the newest of these cars is nearly forty years old, one will not likely find it at your friendly local car dealer. There are specialists scattered across the country who sell exquisitely-restored models, with exquisite pricing to match. If looking for a project to restore in the home garage, searching the internet will yield best results. Due to the relative scarcity, the Datsun is a bit more challenging to restore to showroom condition, but the internet has made spreading innovative solutions significantly easier. Modern engine swaps are immensely popular. One option, giving around 150hp before modifications, is the KA24-series engine found in both the 240SX and Nissan Hardbody pickup trucks. A more radical option is the SR20DET turbocharged four-cylinder found in the Japanese-market Silvia and 180SX coupes, producing at least 200hp, but capable of astronomical figures that a fifty-year-old convertible chassis probably shouldn’t try to handle. The MGB has been a favorite of racers and general enthusiasts since day one. More performance is readily available. The MG factory even got in on the engine swapping game in the late Sixties, first with the MGC, which was a MGB with an inline-six engine beneath a bulging hood, and then in 1973 with the MGB GT V8. The GT model was a hard-top hatchback version of the classic roadster, and with a power increase from a lightweight aluminum Rover V8 (which started life as a Buick design) the V8-powered car was a revelation. Unfortunately, this coincided with a fuel crisis and ever-increasing safety and insurance regulations in the US, so the V8-powered car never made it to the States. This didn’t stop industrious owners from replicating the work the factory had performed, on both the GT and the roadster body. As the Rover V8 continued in production well into the new millennium, powerful and reliable fuel-injected versions are plentiful. Early carbureted engines started around 160hp, where modern options offered up to 220hp before any modifications. Again, plenty for a lightweight roadster. Other popular options include the Ford small-block V8, which has nearly limitless modification potential, and the General Motors sixty-degree V6 engine, which among other cars found a home in the Chevrolet Camaro of the Nineties. Owning any older car, no matter the make or model, will be made much easier with the assistance of those who have been there before. The internet has revolutionized classic car restoration, by bringing the wisdom of these sages and gurus to the entire world. Clubs and forums have sprung up for nearly every classic, and these two are no exception. The following websites will also link to local clubs if you want to find locals who are similarly afflicted with the classic roadster disease. 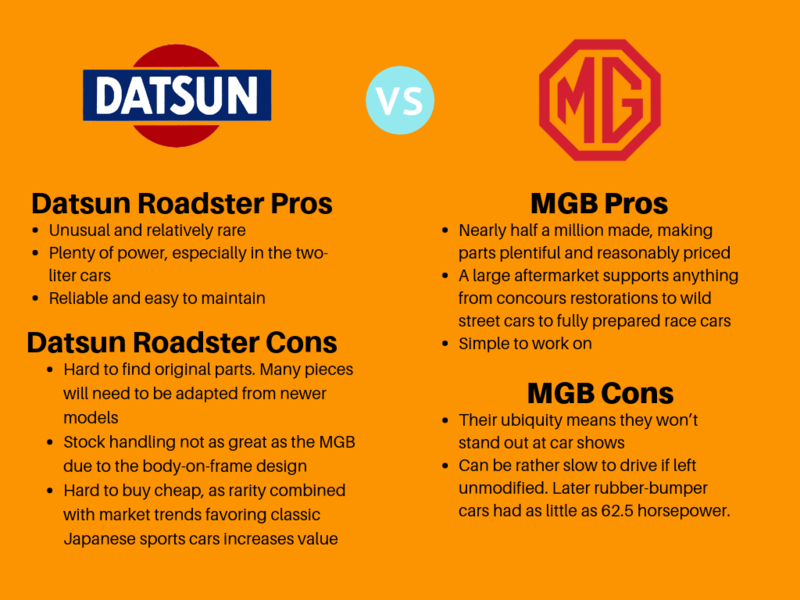 Either the MGB or the Datsun roadster will be a rewarding project for a classic sportscar enthusiast. Both models enjoy a following of enthusiasts who love keeping their beloved cars on the road and want to spread the gospel of their favorite car to more potential owners. Both the MG and the Datsun are mechanically simple, making repairs and restoration much less challenging than more exotic cars. Both cars can be purchased and restored for reasonable amounts of money, making either one a perfect choice as a first classic sports car. odio justo mattis Phasellus commodo Praesent dolor. ultricies dolor risus.